Just any cholesterol-lowering food might not be good for you. While choosing foods to lower your cholesterol, you need to exercise a ‘horses for courses’ approach. There are two different types of cholesterol. One is good. One is bad. If your good cholesterol is low and you are eating foods that lower bad cholesterol, it is not the most effective approach. In the same way, if your bad cholesterol is high, and you are eating foods that improve good cholesterol, you will not get the optimal results either. Cholesterol is a waxy substance found in every cell of our body. It is essential for some of our bodily functions. Cholesterol is a natural product that is made in your liver. However, when your production of cholesterol outgrows your use of cholesterol, or if your intake of cholesterol exceeds your body’s need, you end up with too much of it, which increases your risk for heart disease. However, not all cholesterol is bad, as you’ll soon see. The thing is, cholesterol can’t dissolve in the blood. It must be transported through your bloodstream by carriers called lipoproteins – a combination of fat (lipid) and proteins. These carriers help distinguish the different types of cholesterol. The two types of lipoproteins that carry cholesterol to and from cells are low-density lipoprotein, or LDL, and high-density lipoprotein, or HDL. And based on which lipoprotein carries the cholesterol, it is classified into LDL cholesterol and HDL cholesterol. LDL cholesterol is what gives cholesterol its bad name. LDL cholesterol helps in the formation of plaques – thick, hard deposits that can clog arteries and make them less flexible. This condition is known as atherosclerosis. Atherosclerosis can happen in almost any artery. If a clot forms and blocks an artery in the heart or brain, it can result in a heart attack or stroke. Another condition called peripheral artery disease can develop when narrow arteries supplying blood flow to your limbs get obstructed by plaque deposits. HDL cholesterol is the nice guy in the cholesterol family as it helps remove LDL cholesterol from the arteries. Experts believe HDL acts as a scavenger, carrying LDL cholesterol away from the arteries and back to the liver, where it is broken down and passed out from the body. One-fourth to one-third of blood cholesterol is carried by HDL. Not surprisingly, the higher the percentage of good cholesterol, the lower your risk of heart disease. A healthy level of HDL cholesterol may also protect against heart attack and stroke, while low levels of HDL cholesterol have been shown to increase the risk of heart disease. Oats: Changing you morning meal might be the simplest way to whittle down your LDL cholesterol (the bad kind). By taking two servings of oats, you can lower LDL by 5.3 percent in only six weeks. Oats contain beta-glucan, which plays a key role in removing LDL cholesterol from the body and excreting it. Nuts: A study shows that people lowered their total cholesterol by 5.4 percent and LDL cholesterol by 9.3 percent by taking 1.5 ounces of walnuts six days a week for one month. Details of the study can be gleaned from the American Journal of Clinical Nutrition. And just to make it easy for you, 1.5 ounces is about a shot glass and a half. Tea: The world knows tea contains a lot of antioxidants to fight inflammation, and in some cases even fights cancer. Not many people know, however, that tea is also a great defense against LDL cholesterol. According to research conducted with the USDA, black tea has been shown to reduce blood lipids by up to 10 percent in only three weeks. Beans: Researchers at Arizona State University Polytechnic found that adding ½ cup of beans to soup lowers total cholesterol, including LDL, by up to eight percent. The fiber content in beans plays an important role in limiting the absorption of dietary cholesterol. Olive oil: This staple ingredient of the Mediterranean diet has found its way to the shelves of grocery stores worldwide. The reason? It is full of heart-healthy monounsaturated fatty acids, which can help lower LDL cholesterol. Olive oil has the added benefit of helping keep your waistline where you want it to be. Strawberries: A research team set up a study where they introduced 500 g of fresh strawberries daily into the diets of 23 healthy volunteers. The volunteers were subjected to blood tests before and after a month of maintaining this new diet. The results of the study, published in the Journal of Nutritional Biochemistry, show that the level of bad cholesterol fell to 13.72 percent. In addition, the total amount of cholesterol and triglyceride levels fell to 8.78 percent and 20.8 percent, respectively. Interestingly, the levels of HDL “good” cholesterol remained unchanged. Fatty fish: Fatty fish are loaded with omega-3s, which can help raise HDL levels. 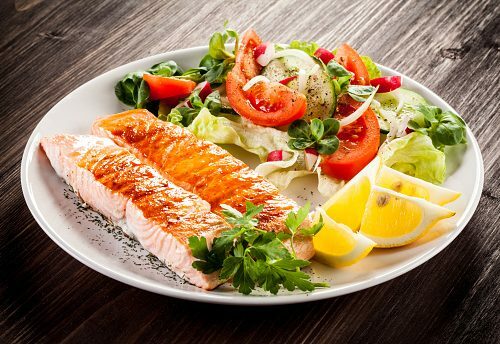 According to research from Loma Linda University, replacing saturated fats with omega-3s like those found in salmon, sardines, and herring can raise good cholesterol as much as four percent. Red wine: The Mayo Clinic suggests that red wine in moderation can reduce heart disease. The antioxidants in red wine increase the HDL levels to protect against artery damage. Chocolate: Chocolate is good for you. And even better for your arteries. In a 2007 study, participants showed a 24 percent increase in HDL levels after taking cocoa powder over a period of 12 weeks. In the same study, people in the control group showed just a 5 percent increase in HDL. The full details of the study are published in the American Journal of Clinical Nutrition. Remember to choose the dark or bittersweet kind. Avocado: This vegetable/fruit is a great source of heart-healthy monounsaturated fat, a type of fat that may actually help raise HDL cholesterol while lowering LDL. And, more than any other fruit, this delectable item packs cholesterol-smashing beta-sitosterol, a beneficial plant-based fat that reduces the amount of cholesterol absorbed from food. However, too much avocado can add to the waistline. Based on their review of 10 avocado studies involving 229 participants, the researchers uncovered that consuming one or one and a half avocados a day worked to significantly reduce cholesterol levels. Furthermore, avocado intake worked to lower LDL cholesterol when the fruit was substituted for other sources of fat. As you can see, just any cholesterol-busting food might not work well for you. Your first step is to determine (with the help of a blood test) whether you have a low HDL problem or a high LDL problem, and then choose your foods wisely.